Surrounded by city officials and supporters, Mayor David Briley signs the Equal Business Opportunity law at City Hall on Friday, January 11. 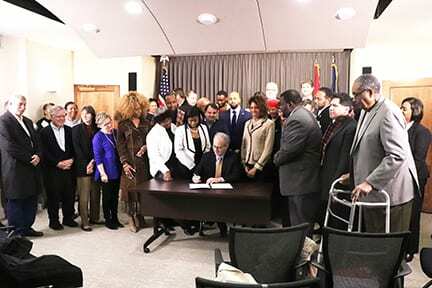 NASHVILLE, TN — The Equal Business Opportunity (EBO) law Mayor David Briley signed last Friday does not establish quotas but it does set new rules to stop discrimination against minority-owned firms that have been shut out of doing business with the city for decades. The operative word in three disparity studies conducted between 1999-2018 is “underutilized”. Small minority and women-owned businesses, called MWBEs, have not been getting their fair share of contracts awarded by the city and it has nothing to do with their competence or competitiveness. It has more to do with their color. “We’re not doing business the same way. It’s a new day for Metro government,” said Councilwoman Tanaka Vercher, one of the bill’s eighteen co-sponsors. The EBO replaces the 2008 Procurement Nondiscrimination Program (PNP). It was voluntary and failed to address the disparities in contract-letting that the Atlanta-based Griffin & Strong company documented in 2012, 2014, and 2017 benchmark reports. “I would dance at his wedding if he wasn’t already married,” said Marilyn Robinson, Executive Director of Nashville Minority Business Center. Robinson has been promoting Metro’s minority businesses since 1984. She said several mayors had the opportunity but not the political will to do what David Briley did. “We’ve always met with resistance. He got in front and everybody got in line behind him. 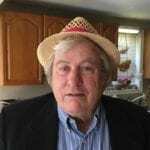 He moved the train,” Robinson said. The new program requires contractors to actively recruit and include MWBEs in their proposals or they face elimination in the contract bidding process. If they offer at least three MWBE firms some part of a contract, which can vary in dollar amount or overall percentage, and still cannot find a minority subcontractor, the Business Assistance Office (BAO) is supposed to help them find one. If the BAO determines the contractor is “nonresponsive” the Purchasing Agent is notified and the bid will be rejected. This is a significant change from past practice when prime contractors routinely by-passed minority firms by stating in writing they couldn’t find any. Under the new law, contractors will have to document their payouts to subcontractors, their qualifications or licenses, and identify the supplier, goods, and services provided by MWBEs. “There is a requirement on the back end in to monitor it to ensure what your promised you actually achieved. So we will have a significant uptick in the number of projects that we will be monitoring for post-award compliance,” said Metro Purchasing Agent Michell Lane. The EBO program needs to keep records in order to evaluate it every five years and the BAO is now tasked with collecting data and filing quarterly reports to the Purchasing Agent, Finance Director, and Chief Diversity Officer. If contractors are rejected because they don’t make a good faith effort or engage in discriminatory conduct against MWBEs, or, if they are awarded a contract and it is later terminated for non-compliance, they can appeal to the Procurement Appeals Board. The EBO program will set a non-mandatory percentage goal for overall MWBE prime and subcontract participation in Metro contracts every year. The goal is aspirational and “intended to serve as a benchmark against which to measure the overall effectiveness of the EBO Program” the law states. In other words, the EBO is not a set aside program and stops short of mandating quotas for minority business contracts. But it comes close. The EBO program does set goals at the front end. A committee comprised of the head of the BAO, the Purchasing Agent, and the head of the originating Department will set contract/project goals, including MWBE participation. All goals for the EBO Program are subject to the approval of the Purchasing Agent prior to its implementation. How that actually will work in practice is not clear. The Purchasing Agent has always had the last word on awarding city contracts but BAO’s input will carry more weight now because their disapproval means a first ranked bidder will be eliminated and another bidder will get the contract. “EBO appears to have more teeth but the legislation itself does not guarantee equity and fairness in Metro contracts,” said Alex Coure, an outspoken critic of the city’s voluntary nondiscrimination program (PNP) which the EBO has now replaced. Coure said the EBO needs to assist WMBEs with bonding/insurance and loans or the new law will not overcome the barriers that minority businesses have faced in Nashville since at least 1999. For months Coure and former Councilman Don Majors have been burrs in the saddle of Metro’s Finance Department and the city council used their research and adopted some of their language when they wrote the bill. Neither attended the signing ceremony last Friday.